You probably already know about the IRA, or Individual Retirement Account. There are a lot of options, including the popular Roth IRA, which all have different terms for how much you can contribute to the account each year, what kind of interest rates you earn and how much you can withdraw and when. An IRA, like other retirement accounts such as a 401(k), contains mutual funds, stocks, bonds and other investments. Unfortunately, these types of investments are very volatile since the stock market can change drastically from day to day based on influences like political changes, changes in interest rates, and unemployment rates. Commodities like gold and silver offer a more stable, long-term investment because their value does not fluctuate as widely. Their value also has an upward trajectory over the long term. A gold IRA is a specialized account that holds in it physical gold, as well as other precious metals, such as silver, platinum and palladium. Because gold is the most valuable of these metals, the account is named after gold. A gold IRA works the same way as a traditional IRA. However, it contains bullion coins or bars instead of other types of assets. You can hire someone to manage your gold IRA for you, but most of these accounts are self-directed. A gold IRA can contain any ratio of precious metals. The only four metals allowed in the account are gold, silver, palladium and platinum. However, there is no requirement for a balance for any one of these metals. Therefore, you can have any amount of any metal you like. If you want to collect all gold and nothing else, you can do that. If you want to collect mostly gold and silver with a little platinum, you can do that. Working with a financial advisor and doing your own research can help you choose the best metals for your gold IRA, as well as the best ratio to choose. Your gold IRA will have to be stored in a depository approved by the IRS, and it will have to be reported just like any other IRA. Of course, you can create your own unofficial gold IRA by simply collecting your own gold and other precious metals. These commodities don’t have to be in an official retirement account to retain their value. 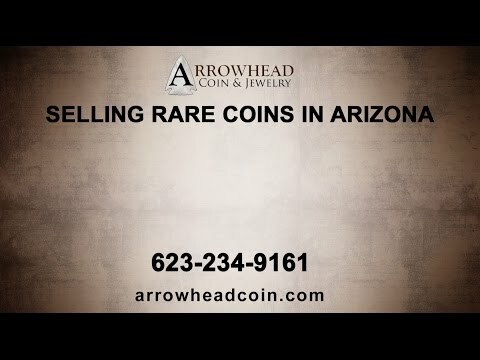 Arrowhead Coin and Jewelry in Arizona can help you with your Precious metals IRA investment. Arrowhead Coin is an authorized dealer for IRA to supply you with the precious metals to help meet your investing needs. We sell gold; highly sought after gold eagles, gold krugerrands, gold maples and gold bars. We also sell silver rounds, silver eagles, silver bars and junk silver. Since we regularly buy gold and silver, we have a large, updated stock at all times. You can start building your collection now to strengthen your investment for your retirement. Stop by our Arizona shop to buy gold to build up your portfolio or to sell gold in Arizona to make room for other investments. We can help you make the right choice for your goals.